The rise of ultra-right in the United States, with the barely hidden encouragement of Trump, is worrying. Not only the American proletariat, but the international working class as a whole is threatened by repressive trends. Positions apropos of ‘Charlottesville (VA) of the American internationalist current that referring to Raya Dunayevskaya, calls itself 'Marxist humanist' are critically reviewed from the point of view of the Italian and, especially, the German-Dutch Communist Left. The latter is mainly based on the historical experiences with the rise of fascism and national socialism in Europe in the 1920s and 1930s. From this point of view Fascism is a phenomenon limited to the now bygone period of counterrevolution after the 1917-1923 revolutionary wave. As a form of government fascism today is not on the agenda. However, populism is. In one of their analysis of Charlottesville, Marxist Humanists do not say anything about the role of the bourgeois left: The Democratic Party and those trade unions and organizations for civil rights, women's rights, sexual minorities, etc., that support the Democrats. Nor does it pay attention to the way the Democrats accommodate to the Trump government. The objection to this is that even if one could agree that Marxist-Humanitarian dialectics would prevent the working class falling into the trap of choosing the lesser evil that the bourgeois left would represent, the present reality is that popular human thinking generally does fall into this trap. Raya Dunayevskaya’s 1963 American Civilization on Trial: Black Masses as Vanguard - the theoretical-historical source of actual analyses, should be part of any serious discussion with the Marxist Humanist internationalists. This raises questions about similarities and differences between the situation in the United States and other countries. At the same time, there are differences in analysis and positioning, not only within the bourgeois left, but also between proletarian internationalist groups. This article focuses on the position of the American internationalist current that referring to Raya Dunayevskaya, calls itself 'Marxist humanist.' (1) It will do so from the point of view of the Italian and, especially, the German-Dutch Communist Left, which is mainly based on the historical experiences with the rise of fascism and national socialism in Europe in the 1920s and 1930s. The Communist Left did not analyze fascism the way the present bourgeois left does. (2) It explained the fascist takeover of state power in Italy, Germany, and Spain as the result and completion of the defeat of the revolutionary class struggle in these countries. In all these cases the working class, either influenced by Social-democracy (Germany and Italy), or by Anarchism (Spain), and in every case by the Moscow Communists, was distracted from struggle for its class aims and was brought to the defense of bourgeois democracy. Finally, the bourgeoisie decided to accept Fascism as a form of government, without the proletariat having any choice in it. The international counter-revolution against the revolutionary struggle in Italy, Germany and Spain took the form of Fascism, in the Soviet Union that of Stalinism, and in France, England and the United States that of Democracy. No coincidence, Fascism, Stalinism and Democracy have been the three bourgeois ideologies, under the flags of which the Second World War was fought, perfectly hiding the reality of state capitalism, terror, and mass destruction by all fighting imperialist blocks. From this point of view, Fascism is a phenomenon limited to the now bygone period of counterrevolution after the 1917-1923 revolutionary wave. As a form of government fascism today is not on the agenda. However, populism is. To underline this distinction between the Interbellum and the present, I call the present groups that base themselves upon Fascist ideologies, Neofascist. The positions of the Communist Left have been characterized by its a refusal of the tactics that the Bolshevik Party by means of its dominance on the Comintern imposed on its member parties, transforming them into instruments of the external policy of the Soviet Union. These tactics, such as parliamentarism and electoralism, the formation of fronts with ‘progressive’ parts of the bourgeoisie, and (to different degrees) trade unionism, found their origin in the struggles for reforms before World War 1. The Communist Left, specially the German and Dutch Left, however considered the period of reforms to be over. Social-democracy, in continuing these tactics would become the left wing of the bourgeoisie by its participation in defending national capital in World War 1, followed by Stalinism and most Trotskyist organizations in World War 2. Therefore, most parts of what in the USA and in Europe is seen as the Left (from the liberal Democratic Party and its appendices to Social-democracy and Labour, many Anarchist organizations, all Trotskyist, Stalinist and Maoist organizations) are considered by Left Communism as left-bourgeois organizations with a more or less working class verbiage. To my knowledge, the influence of the Communist Left in the USA has limited itself to that of the German immigrant Paul Mattick (later associated by Karl Korsch) and the publications International Council Correspondence, Living Marxism, and New Essays. (3) At the other hand, before, during and after WW1 specially the IWW have influenced several groups in the German harbor towns, that were to form the German CP, and later of course Mattick in the USA. Proletarian internationalism during WW2 in the USA didn’t limit itself to council communism. As militants in many other countries did, Raya Dunayevskaya in the USA broke with Trotsky in 1939, when he continued to maintain that the Soviet Union was a ‘workers' state’ even after the Molotov-Ribbentrop Pact. She concluded from this that workers couldn’t be asked to defend this ‘workers' state’ allied with Nazi Germany in a world war. Dunayevskaya argued that the Soviet Union had become 'state capitalist'. These different origins explain why from the point of view of Left Communism, there is a suspicion that American internationalists inherited certain tactics from Trotskyism, specially their attitude towards ‘the Left of Capital’, working in left-bourgeois organizations and/or trying to form fronts with them, defending bourgeois democracy, and trying to gain influence in the unions. Of the groups based on the Communist Left, Internationalist Perspective (IP) (4) on 22-11-2016 devoted an article, This is what democracy looks like to a criticism on the protest actions after the election of Trump. IP points at the ongoing economic crisis and the political fraud under the dissatisfaction with the Democrats. IP also suggested that trade unions and a left-bourgeois like Bernie Sanders have made way for Trump by blaming foreign competition and trade agreements for the economic problems. In addition, IP did not see in the Trump government a historic turnaround that the protesters fear: "Even a pro-revolutionary group like the Marxist Humanist Initiative was caught up in the anti-Trump hysteria. ‘The whole world has been turned upside down’, it proclaimed on its website, exhorting its readers to fight, not against capitalism but against ‘Trumpism’." In Anti-Fa? No, Thanks, (5) IP, in commenting the march of neofascists in Berkeley, enlarged its criticism to the subject of anti-fascism. Without mentioning MHI, IP demonstrates relatively accurately the historical position of the Communist Left on the formation of anti-fascist fronts in the 1930s. However, when attempting to analyze the current situation, the article partly falls back on a bourgeois argument6 by stating that there is no indication that Trump, Le Pen and others will not adhere to the basic rules of bourgeois democratic game. The article proposes a perspective, but this remains abstract because it fails to analyze the actual struggles. IP was severely criticized in Why we are not anti antifa; Why we are anti-anti antifa by Anti-Capital (a group whose historical-theoretical roots remain unclear): “What the so-called Marxists, ‘responsible leftists,’ academic and non-academic socialists miss, besides everything, in their denunciations of antifa is precisely that – that there are fascists organizing demonstrations as a cover in order to physically assault, injure, terrorize black people, brown people, workers organizing for a better wage or better working conditions, and women, and anybody else who might stand in their way”. At several forums efforts were made to discuss antifascism, see Reddit and specially Libcom. Apparently MHI makes a distinction between two kinds of ‘left’, focussing on ‘the real left’, appealing for “an independent perspective—grounded in self-activity from below as guided by a philosophy of human liberation”. In their latest Editorial, Will We Allow Trump to Get Away with Fomenting White Supremacy and Racist Violence? MHI continues along this line of thought. But in this extensive analysis of Charlottesville, the MHI does not say anything about the role of the bourgeois left: The Democratic Party and those trade unions and organizations for civil rights, women's rights, sexual minorities, etc., that support the Democrats. Nor does it pay attention to the way the Democrats accommodate to the Trump government. MHI only sees the confirmation of its past analysis. Even if we could agree that Marxist-Humanitarian dialectics would prevent the working class falling into the trap of choosing the lesser evil that the bourgeois left would represent, the present reality is that popular human thinking generally does fall into this trap. 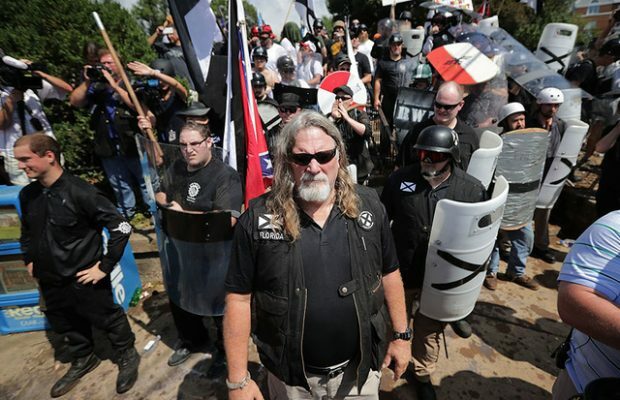 At the end of August 2017 Setup in Charlottesville written by the publication in the U.S. Internationalist Notes, affiliated to the Internationalist Communist Tendency (Italian Communist Left) tries to analyze actual events in the USA, basing itself on the ‘classical’ refusal of anti-fascist fronts. This article not only analyzes the function of the left of capital in relationship to the government and its policies, to the extreme right and Neofascism, with respect to the division of the class - specially by promoting identity politics -but, most importantly it explains Neofascism as an appendix of the state for the repression of proletarian struggles. So far, this article limited itself to MHI. The Marxist-Humanist group News and Letters Committees in its latest statement, Rising U.S. racism challenges all freedom movements, NLC refers to Raya Dunayevskaya’s 1963 American Civilization on Trial: Black Masses as Vanguard – like MHI - as the theoretical-historical source of their actual analyses. This major contribution, underlining the unfinished character of the bourgeois revolution in America and the vanguard position of the Afro-American proletariat should be part of any serious discussion with the Marxist-Humanist internationalists, a discussion that should not be evaded. 1) More about this current see in Wikipedia Raya Dunayevskaya and Marxist humanism. As far as I know this current is split presently in several organizations, of whom I’ll mention News & Letters Committees (NLC) and Marxist Humanist Initiative (MHI). The description of differences between these organizations (unknown to me) would go beyond the subject of this review. 2) The present bourgeois left discusses criteria such as discrimination on grounds of race or culture, the formal acceptance or refusal of the democratic mechanism to change power, anti-Semitism 'or' recognition of the state of Israel, all criteria which can not even stand before the historical reality of fascism in the twenties and thirties. 3) For the differences between the American and Dutch council communists in their analysis of the Spanish Civil War see the chapter on this subject in Philippe Bourrinet The Dutch and German Communist Left (1900–68). ‘Neither Lenin nor Trotsky nor Stalin!’ - ‘All Workers Must Think for Themselves!’ or version at Left-dis.nl. 4) This group started its existence as a split of the International Communist Current (ICC), back in the 1980s. Lacking militance, it is becoming more and more influenced by Communisation. However, contrary to most groups that refer to the German and Dutch Left, they don’t shy away from polemics. 5) Publishing date: May 8, 2017. 6) See our note 2. Even if one could agree that Marxist-Humanitarian dialectics would prevent the working class falling into the trap of choosing the lesser evil that the bourgeois left would represent, the present reality is that popular human thinking generally does fall into this trap. I see that the IMHO are running a meeting again this year at Houseman's London bookshop on the 7th Nov with the Anderson/Black/Mills line-up being joined by Paul Mason this time. Fred's longer follow-up part 2/2 of this blog piece didn't get much comment but is well worth a read, and given the initial reference to Internationalist Perspective reminded me to re-read the long 'locked' thread around the question ''Was the Union War against the Confederacy a progressive war or imperialist bloodbath'' which for all it's heated exchanges I also found very useful in clarifying my own ideas.